The fifth track off of No Line on the Horizon album, “I’ll Go Crazy If I Don’t Go Crazy Tonight”, is played live for the first time on the David Letterman show Wednesday night. This is the third night of U2’s week long appearance on the Letterman show. Bono, The Edge, Larry and Adam also took part in show’s tradition of a Top Ten list. Tonight’s list was “Things U2 Have Learned Over the Years”. The highlight was The Edge’s handling of one of his Top Ten items. Edge’s line was “Cool Name: The Edge; Uncool Name: The Itch”. Instead, The Edge substituted uncool name “The Itch” for “Sting”. 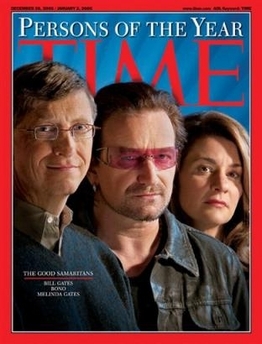 Continue to watch a news broadcast in which Bono ‘feels himself’ in NYC. 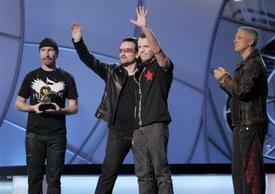 The Grammy Awards Show is over and U2 are winners. They won for every category they were nominated, again. Steve Lillywhite won a Grammy for Producer Of The Year, Non-Classical category due to his work on How to Dismantle an Atomic Bomb and Jason Mraz’s album, Mr. A-Z . The only band on the list, U2 is one of the top 10 cultural events in the U.S.